Wow! I’m super excited and very honoured to be nominated for my very first blog award. I recently found a delicious looking post on grilled squid salad posted by krumkaker. She’s a Scandinavian who is currently living in Rome and making the most of it in her beautiful posts. I liked her post, she liked mine and the rest, as they say, is history. You should hustle on over there and check out her blog, Think of it as ‘armchair traveling’! I compulsively buy food magazines and almost never read them. My favourites are: Lucky Peach, bon appetit, Food and Wine, Cooks Illustrated, Gourmet, Our local free foodie publication is called City Palate, I always read that. Other than magazines, I almost never buy anything unless it is on sale. I have an undergraduate degree in Paleontology. I adore traveling. I never stepped foot outside of Canada until 2007. We had our first family vacation in Costa Rica, Then we got the travel buy really bad. We went to Egypt, UK, Singapore, South Korea, Australia, Malaysian Borneo, Indonesia, Thailand, Hawaii, France, Belgium and the Netherlands. I have a Starbucks City mug collection from almost all of the above places. I’m missing Costa Rica, Egypt and a mug from Kona, HI. When I cook I clean as I go, except for the floor. It gets cleaned by two furry four legged creatures. Besides food, I geek out over geocaching, geocoins, Game of Thrones, The Walking Dead, and Breaking Bad. Lisa from The Gourmet Wog . Every time I read her blog I’m reminded of being in Australia. She has a great personality and it shows through in her writing. Albatz Gallery & Blog a very versatile blog with beautiful photos, posts on art, travel and food. From Alfredo’s With Love This guy can whip up meals magically, almost out of no where for a crowd of people…and he likes it! The Cooking Chook Someday I’ll make macarons just like hers! 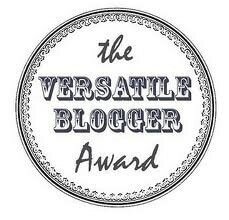 It’s your choice to accept or not but if you do, please thank your nominator (me), post seven things about YOU and then nominate some deserving blogs for the Versatile Blog Award. Sign me up for Dish n the Kitchen updates! Need more Dish ‘n’ the Kitchen?